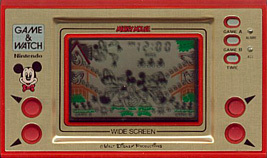 Mickey Mouse is exactly the same game as Egg, but starring Disney's Mickey Mouse in the title role, catching eggs in his basket. Instead of the cockerel, Minnie Mouse appears at the window to show that you will only get a half-miss if you drop an egg. Mickey Mouse was the only one of the two games to be released in Japan, but in all later appearances it has been replaced by Egg. Eggs roll out of three of the chicken coops. Eggs roll out of all four chicken coops.